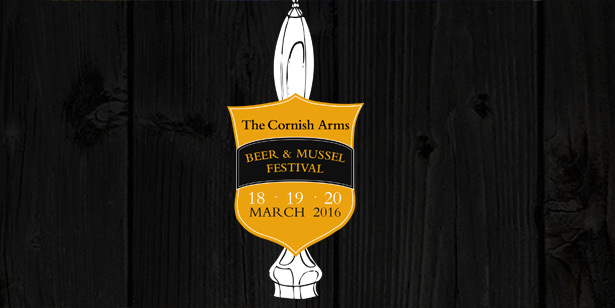 On the 18th – 20th March we are holding our annual Beer & Mussel Festival at The Cornish Arms and we are holding a fab competition to get you in the festival mood. Send your best festival photos to our Twitter and Facebook page using #BeerandMussel and we will pick our favourites to win 4 1/2 pints and 4 mussel tokens before the festival weekend. Winners will be picked during Friday, Saturday and Sunday and will be contacted via Facebook or Twitter. Prize consists of a token for a half pint of beer or cider from the festival. Prizes will be awarded throughout the weekend and must be redeemed during the weekend of the Beer & Mussel Festival 2016. You must be the photographer and owner of the copyright for any image. Please respect the privacy of others and seek out permission of anyone included in your entries. The Seafood Ltd. assumes no responsibility for possible fraud committed by any contestant. The Seafood Ltd. reserves the right to remove or disqualify any entry at any time at our discretion. By submitting images, the photographer grants permission to The Seafood Ltd. to display or use submissions in any promotional material free of charge. This contest is in no way sponsored, endorsed or administered by, or associated with, Facebook, Twitter, Instagram or Pinterest. By entering this contest you release Facebook, Twitter, Instagram or Pinterest from any related claims. Any questions, comments or complaints regarding this competition must be directed to The Seafood Ltd.. The Seafood Ltd.reserves the right to modify the terms and conditions at any time, at its discretion, and without prior notice. The Seafood Ltd. reserves the right to terminate this competition at any time. By entering this competition, all contestants hereby consent (except where prohibited) to the use by The Seafood Ltd.of the contestant’s name, photograph, and entry without any further compensation. By entering this competition you release The Seafood Ltd. from any claim made by the copyright owner of a photograph you submit. Staff from The Seafood Ltd. are excluded from entering. The Seafood Ltd. reserves the right to withdraw prizes if entries are not deemed worthy winners. If you have any further questions relating to this competition please email us at press@rickstein.com.